In 2011, the Utah Division of Water Quality green-lighted a water permit for what could be the first tar-sands mine not only in Utah but the country. It’s a distinction of pride for the owners of U.S. Oil Sands, Inc., a Canadian company, and distinction of shame for environmental activists, who see the project as mountain-top removal that, at the least, will scar some of Utah’s most pristine high-desert country, near the Book Cliffs, and at the worst, will contaminate groundwater in the area, poisoning springs that wildlife drink from. The developer’s pitch for the project is light on ecological footprint and heavy on economic impact. The plan is to use high-temperature water mixed with an eco-friendly, citrus-based chemical solvent to extract the low-grade petroleum product, using a process that allows 95 percent of the wastewater to be recycled. 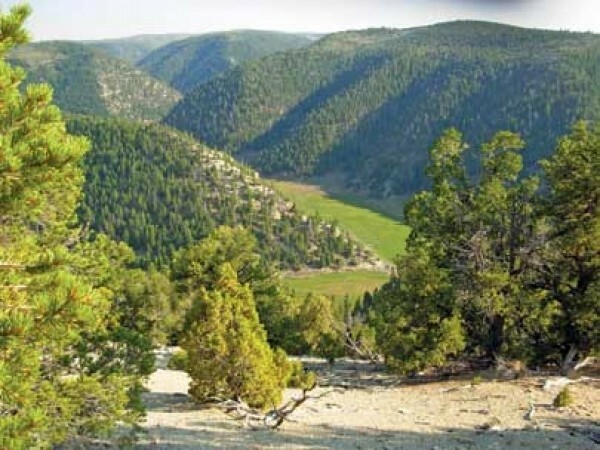 But where the developer sees the process as giving the bowels of the project area a healthy cleanse, activists see a hot, toxic enema being applied to roughly 212 acres of irreplaceable wilderness land. Joro Walker is an attorney for Western Resource Advocates, the organization representing Living Rivers, a nonprofit Moab environmental group that has legally challenged the permitting of the mine. Walker worries that nobody, especially state regulators, understands what’s going into the process, and that the project is not being given careful enough consideration, in much the same way states allowed fracking to proceed without careful scrutiny. “It’s really hard to visualize how giant this threat could be. I don’t think people in Utah are really paying attention. This project is pretty big, but it could be carried forward on a grand scale,” she says, adding that the company has leased an additional 32,000 acres in the area they could potentially expand into. Walker’s challenge to the state is that Utah’s environmental regulators did not require a full-blown ground-water permit, relying rather on the company’s application record, which found that the nearest groundwater aquifer that could get into drinking water via the Green River was 1,500 feet under the surface. While Walker says allowing a shortcut to a new, untested mining process is not smart policy, Cameron Todd, the CEO of U.S. Oil Sands, sees the challenge as an effort to block the development by whatever means necessary. In August, an administrative-law judge for the state ruled that the decision to grant the permit without a full, independent groundwater analysis was warranted. It was one of the final state hurdles before the mine could go operational in its 212-acre project area that the company hopes will produce 2,000 barrels of petroleum product a day by 2013. But the company will still have to endure legal challenges, starting with the appeal made by Walker on behalf of Living Rivers. The Utah Water Quality Board will hold a hearing in Salt Lake City on the matter Oct. 24. Although Walker has many concerns about the safety of the water when mixed with the tar sands and about the possibility that the seeps could leach into major aquifers, the legal challenge Walker presents plays to the kind of legal technicality that exasperates developers like Todd. While the state gave the project a thumbs-up based on U.S. Oil Sands’ own evidence that a major aquifer was 1,500 feet below the surface, the company’s own application suggests there are surface deposits of water, as well as springs and seeps in the area. Walker’s appeal points out that, technically, state law requires a full groundwater-permit process when there is a possibility of pollutants entering “all” water sources. Walker means to convince the board that “all” means sources as small as a local seep—a sticking point she hopes to argue as far up the judicial process as necessary. While the strategy could be viewed as legal road-blocking, Walker argues that at the least the extraction process could affect wildlife that drink from local springs. She also points out that while the water waste is recycled, the pits the solvent water burns into are unlined and unmonitored, raising questions about how the chemicals could possibly move through the ground. Todd points out, however, that the solvent has been found environmentally safe by the Environmental Protection Agency and has even been used to help clean oil spills along beaches. Todd also acknowledges it’s never been used in a mining project like this. In earlier legal briefs, Living Rivers presented the testimony of a University of Utah geophysicist who said the byproduct of the water solvent mixed with the bitumen from the tar sands could be carcinogenic. Local activists are hoping scrutiny of the project increases but say they’ve met resistance in educating people about the project. The activist movement Peaceful Uprising has taken people on field trips to the area to show them the impact it could have, only to now have the School and Institutional Trust Lands Administration (SITLA)—the agency that’s leasing the land to U.S. Oil Sands—bar people from visiting the site. Todd says his understanding is that SITLA has restricted the area as a public-safety concern since there are open pits in the area. Raphael Cordray of Peaceful Uprising has visited the site multiple times and says people don’t realize the blight that will be brought to the area along with the potential water pollution. “The displacement and destruction of the land would be like a huge, awful scar,” Cordray says. She also says that if mining equipment runs through the night, the light pollution could be seen from nearby Arches National Park. For Walker, it all comes down to the state’s fast-tracking of an entirely new and little-understood mining operation. The Utah Water Quality Board will hear arguments about the tar-sands permit Oct. 24 at 9:30 a.m. at the Division of Water Quality, 195 N. 1950 West, Salt Lake City. Members of the public are welcome to attend but will not be able to speak at the meeting. Members of Peaceful Uprising, under the name Utah Tar Sands Resistance, will host a “science fair” in the lobby of the building and will be handing out information about the project and its environmental impacts.